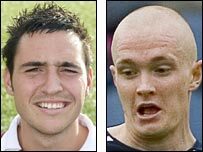 New Stirling signings Ross Harris and Paul Murphy suffered nightmare official debuts as First Divison Albion crashed out of the Challenge Cup. They both played as Stirling lost 5-1 to Third Division outfit Montrose. Midfielder Harris, who started his career with Celtic and spent last season with Dundee, won his contract after impressing in pre-season. Defender Murphy made 101 appearances for Stenhousemuir before his release and showed up well as a trialist. He was praised on the Stirling website for his displays against St Johnstone and Partick Thistle.